We’d love your help. Let us know what’s wrong with this preview of Class and Stratification by Rosemary Crompton. Inequality in its many forms is becoming an ever greater problem in modern society. The revised edition of this popular book explains why it is so important to understand class and stratification, and how the tools used to analyse these divisions can help us to understand and confront problems of inequality. This third edition of Class and Stratification has been extensive Inequality in its many forms is becoming an ever greater problem in modern society. The revised edition of this popular book explains why it is so important to understand class and stratification, and how the tools used to analyse these divisions can help us to understand and confront problems of inequality. 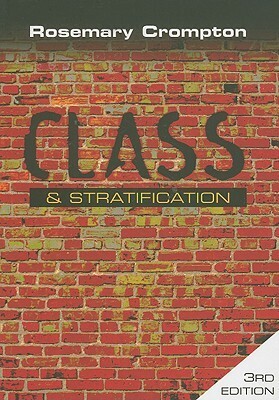 This third edition of Class and Stratification has been extensively revised, expanded and updated, incorporating discussions of contemporary economic and social change. It includes discussions of political and economic neoliberalism and its impacts as well as developments in social theory, such as the emphasis on 'individualization' and the 'cultural turn'. New to this edition is a chapter focusing on 'cultural' approaches to class analysis, which together with established approaches are used to explore new developments in social mobility, educational opportunity, and social polarization. To ask other readers questions about Class and Stratification, please sign up. För allomfattande och lite mossig för att riktigt gripa tag i mig. Använde sig dessutom av en terminologi som uteslöt mig lite. Men så är det ju andra sidan vetenskaplig text. Det var inte som att jag förväntade mig något annat.